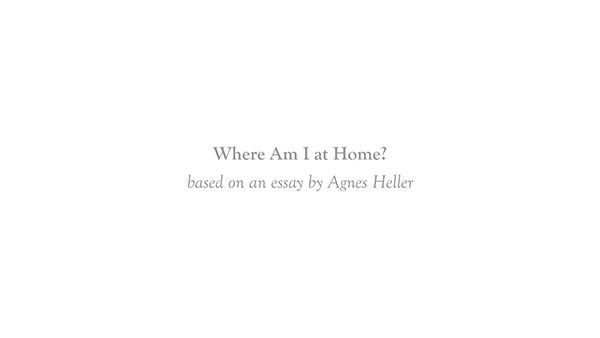 “Where Am I at Home?” is an intertext and work of video art, written, directed and produced by Polina Zioga*, based on Agnes Heller’s original essay “Where Are We at Home?” (1995). The title and question of the work implicates our sense of belonging, in terms of space, time, our spiritual and cultural heritage, but also in terms of politics and the constitutional democracy. The artist re-reads and re-writes the essays’ arguments, appropriating the words, the phrases and the meanings. She speaks of herself and through herself for what can be commonly felt, understood and experienced. 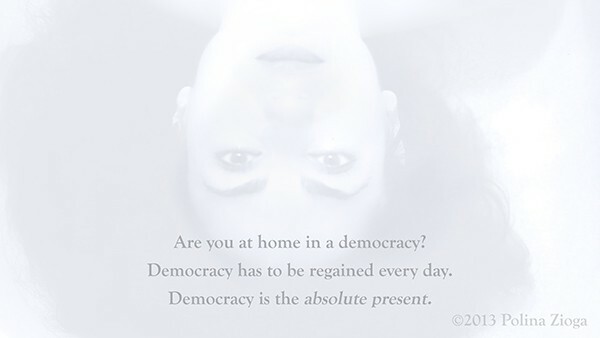 Either being identified as a geographical promiscuous, revealing a homeliness/loneliness, or resorting to the absolute spirit, in practice and by belief, she concludes to what remains a collective quest of belonging – democracy as the absolute present. * On the occasion of H O M E | Women’s Networks: Athens 2013, co-ordinated by Arzu Ozkal and Claudia Pederson, in the framework of Home/s – An exhibition of ArtUP! Media Art in Bulgaria, Greece and Turkey at Benaki Museum Athens, curated by Daphne Dragona and Katerina Gkoutziouli, organised by Goethe-Institut Athen.